International Policy Digest: Is the recent Saudi permission for women to drive cars and enter a stadium to watch men in sports competitions merely a political maneuver or a real reform? Daniel Pipes: All signs point to Mohammad bin Salman, the effective ruler of Saudi Arabia, being very serious about basic changes. So, I see this as a real reform. 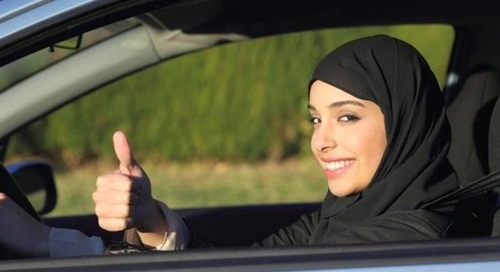 A Saudi woman happy to drive. Let's discuss the reason for these reforms at this moment: Do the rulers feel at risk? Yes, the leadership realizes the current path will lead to poverty and weakness. Avoiding that fate requires making fundamental changes in nearly every aspect of life. Or was the Saudi decline in income what led the government to increase women's participation in the economy? Yes, the need to bring women more into the economy is the larger implication of the permission to drive. But it's less the immediate decline in income that scares the leaders than the long term. For example: Should electric cars prevail, one estimate expects the price of oil to decline to US$10 per barrel. Or was it the Yemen crisis and Saudi Arabia's failure to achieve its goals there? That may have had a small role in the decision but the urgent need to change the fundamentals of Saudi life strikes me as key. Women will be driving but many other restrictions remain in place – such as permission from a mahram (unmarriageable kin) to marry or leave country. Will the government take further steps to abolish patriarchal laws? Yes, that is inevitable. Saudi defiance of universal modern norms, norms that prevail in all neighboring countries, has been impressive but it cannot last. Too many Saudi women and men have experienced the outside world to maintain the mahram system. What do you think of the theory that these changes are part of a US-sponsored project to unite Saudi Arabia with other Arab countries against Iran. That misses the point: These changes are by Saudis to save their country, not by Americans. It's time to move on beyond such conspiracy theories that assume Middle Easterners are but the play things of Westerners. 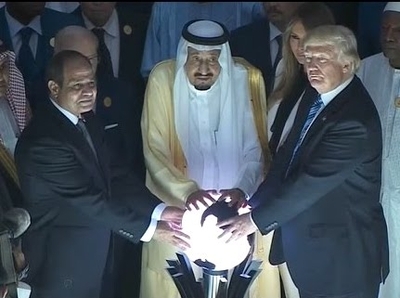 Does Trump control Salman (and, for that matter, Sisi)? Does Saudi Arabia present a different form of Islamism than those in Iran and Turkey? Yes, the government of these three countries each follows a distinctive Islamist tradition. The Saudi one is Hanbali and traces its origins to Ibn Taymiya and Ibn Abd al-Wahhab. The Iranian one to Ayatollahs Borujerdi and Khomeini; and the Turkish one to Said Nursi and Erdoğan. Crown Prince Mohammad bin Salman says Saudi Arabia will return to moderate Islam. But Wahhabi Islam and Salafism generally are rooted in Saudi Arabia. So, isn't MbS saying something internally contradictory? Could Saudi Arabia even in theory serve as a model of moderate Islam? Mohammad bin Salman is referring to the changes that took place about 40 years ago, especially in the aftermath of the Iranian Revolution and Mecca mosque seizure of November 1979. In the fifty years before that, the monarchy sponsored an Islamism that by today's standards was more moderate. While MbS is using that as a reference; in fact, I expect he wants to abandon Islamism altogether. I can imagine Saudi Arabia becoming a center of moderate Islam; stranger things have occurred. Mohammad bin Salman apparently wants to attract more foreign investment and foreign visitors to compensate for the country's decline in oil revenues. But Saudi Arabia is a conservative and traditional society, not a second Dubai, so is this achievable? Coincidentally, I am replying to your question while in Dubai: I assure you that it too is a conservative and traditional society. But its leadership has created a dynamic, open structure in which foreigners primarily can engage in a hyper-capitalistic venture. If Sheikh Mohammed bin Rashid Al Maktoum could do this in Dubai, MbS can do it in Saudi Arabia. For all its hyper-modern economy, Dubai remains in many ways a conservative and traditional society. Will long–term austerity policies and cuts to subsidies increase dissatisfaction in Saudi Arabia and so, increase the likelihood of revolution? You are pointing to the major difficulty facing MbS, namely the need to wean Saudi nationals off easy money. Whether he succeeds depends in good part on his political skills. I am skeptical that he has them. Does Mohammad bin Salman have the necessary power to achieve his plans? How adept is he as a politician? Is he a traditional ruler or a modern dictator? He has the power but we don't yet know how skilled he is; ask me in five years. He's a mix of traditional and modern, a traditional ruler with modern goals. Both the Mohammad Reza Shah era in Iran and Saudi Arabia today have experienced rapid social and economic modernization as well as the opening of social space without commensurate political openness. Do you agree with the theory that KSA is therefore headed for revolution? No, because another possibility exists, that of Singapore, post-Mao China, and the "Asian model," where the regime achieved extraordinary economic growth within a repressive polity. Perhaps the tensions will one day cause an implosion, but this unlikely mix has worked for decades with few signs of collapse. Accordingly, I do not see that the KSA is doomed to revolution; indeed, this model is working very well next door in Dubai. Recent weeks have seen the arrest of journalists and political activists in Saudi Arabia, despite the government calling for an open social environment; is this not a contradiction? Yes, it is. But as one sees in China, Singapore and Dubai, this model works better than anyone expected a half century ago. More that 20 clerics have been arrested for protesting government decisions. Can the Saudi government persuade clerics to accept reforms about women and youth, or will it have to repress them? As with journalists and human rights activists, the government will likely have to use crude force to quiet religious leaders. How much influence does the clergy have over Saudi society? Can it or will it inspire an uprising against Saudi family? The ulema are powerful but less so than the government. They can inspire an uprising, just as happened in Mecca in 1979, but they cannot prevail. Nice logo, good ideas. But will it work? Mohammad bin Salman plans to end Saudi Arabia's dependence on oil by 2030. Is this feasible or a dream? That's a too short timetable. Saudi Arabia will still depend on hydrocarbon revenues in thirteen years. But the country can take significant steps to lessen that dependence. Can MbS create a national Saudi identity where now exists a tribal identity? A national Saudi identity already exists, apart from tribal identities. The modern state came into being in 1930; as so many other states have demonstrated, that's sufficient time to indoctrinate generations of youth in the existence of a national identity. 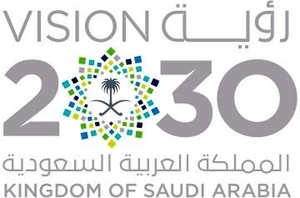 Are you optimistic about Saudi Arabia's future and reforms in the country? The country's future is open, for the first time since the 1920s. I simply do not know enough to predict its course with confidence.